There’s a delightful introduction to magnets, which explains that electrons, planets, and even galaxies can act as magnets. They tell us how we can detect magnetic fields with a compass, and visualize them with iron filings. Several illustrations show us what the fields of disk, bar, and horseshoe magnets look like. And they not only tell us, but show us by using more filings, that opposite poles attract and same poles repel. The law of magnetic force is shown. We learn that even magnets can “overcome the gravitational force of the entire earth” at close range. 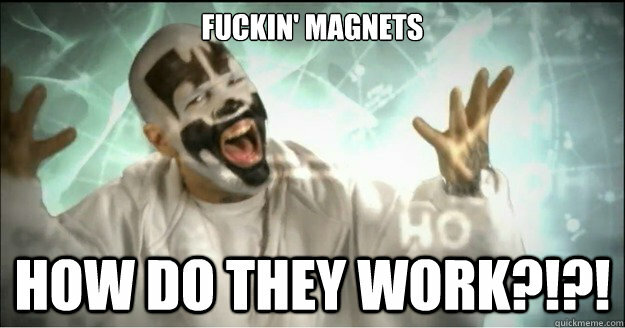 They finish up this first bit by talking about magnetic permeability, which would probably make ICP heads explode, because it’s a little weird. Now it’s time to talk about the earth as a magnet, and they’re kind enough to finally mention that the “magnetic compass appears to have been invented independently in China and Europe in the 10th [sic] Century,” which is a little better than ignoring the Chinese altogether. 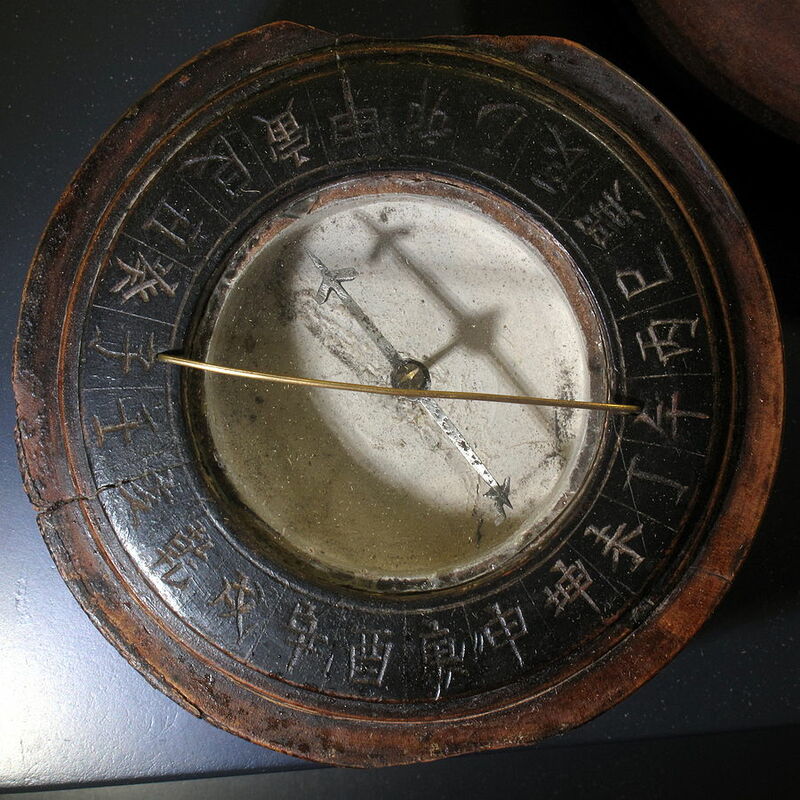 But they still don’t want to give the Chinese credit for inventing it first (which we have solid evidence for), or that the Arabs likely introduced compasses to Europe after picking them up in China (which many historians think, but we don’t yet have proof of). No, they need the Europeans to be at least as clever as those non-white folk, if not more so, so they twist facts. Shame. Sir William Gilbert reappears to discover that “the earth itself is a magnet.” Facts about the magnetic field are presented, such as that its North Pole is actually an S-pole and vice versa, and those poles are not only hundreds or thousands of meters from the geographic poles, but also wander. The writers explain that the poles of a magnet are named for the direction they seek, which is why the North magnetic pole is actually an S-pole. Then their Eurocentrism strikes again, as they give explorer and genocidal brute Christopher Columbus credit for discovering magnetic declination (“the angle that a compass needle deviates from true north”). But the Chinese were over 700 years ahead of the Europeans on that. They seem a bit obsessed with William Gilbert, because they circle back and give him credit for investigating magnetic dip and inventing the first dip needle, when actually an instrument maker by the name of Robert Norman had been making them first, and in fact did the first formal study of magnetic dip. I think they got so excited reading Gilbert’s book that they forgot to look any further. Anyway, I’m sure y’all know that magnetic dip is rather important to paleomagnetism. So it’s quite neat knowing more of its history. Now, I’m aware that creationist claptrap has been remarkably thin on the ground in SPC lately. My darlings, I promise you that dry spell is about to end in a deluge. But we are going to save that for next time, because I want to give it a post all to itself. It’s so dense and concentrated in its nonsense that I believe it deserves an actual sporking. This will be so deeply satisfying. And then we’ll have the unparalleled joy of watching the A Beka folks explain exactly how magnets work, thus proving creationists are less ignorant than ICP.